Senior Edmond Giang holds up the Division 3 Massachusetts State Championship trophy with his teammates after winning the title. Giang began swimming at a . young age and has led the Warriors to success for the past three years. "Not giving it your all is unacceptable. When you’re on that block, you just have to get locked in," Giang said. 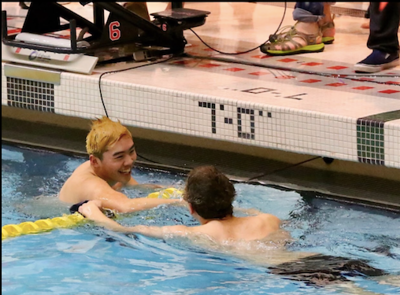 Senior Edmond Giang’s passion for swimming developed in the Wayland Community Pool when he was just in the first grade, swimming for the Mighty Ducks USA competition team. Since first grade, Giang’s reason for swimming switched from a way to pass time to being competitive. Giang swam for club teams throughout both elementary and middle school, and he felt the sport became very competitive when he started swimming for the high school team as a freshman. Giang has since made swimming one of his top priorities since he has started high school because of the competitiveness of the sport and the bonds he created on the team. Giang takes a stroke during a breastroke race at a meet. 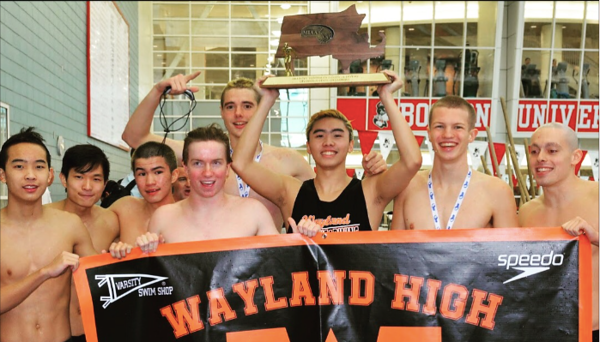 In Giang’s sophomore and junior years, Wayland swimming saw some of the strongest teams in its history. The Warriors went undefeated both years, winning two Division 3 State Championships in a row. Giang is a leader at the pool, and he thinks that it is important that he and other seniors are role models for underclassmen. He felt that when he was an underclassmen, older students had a large impact on making him a better swimmer. Giang feels that the team definitely has the potential to win another state championship this year, but that he has to work hard in helping the underclassmen, especially freshmen, gain confidence. 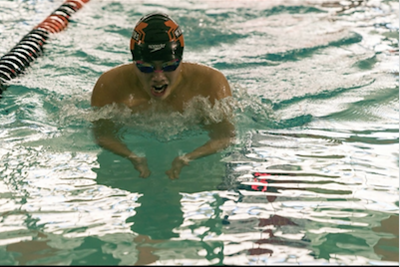 Throughout his time swimming at the high school, Giang has scored many points in competitions, and this year, he can potentially break the record for the most points scored for a single swimmer in Wayland High School history. Giang’s best events include the 100m fly, the 100m backstroke and the 200m individual medley. While Giang acknowledges that breaking the record will be a big accomplishment for him, he thinks that how the team performs overall is more important. Giang shakes the hand of a competitor at the 2018 Massachusetts Sectional Meet after finishing his race and helping the Warriors to a team win at the meet. Through his multiple accomplishments, including putting records on the board in individual events, Giang was recruited by multiple colleges. He received emails and letters from coaches around the country, but he had to contact the coaches of the schools he wanted to go to himself. Giang eventually decided to commit to Bates College, where he will be swimming next year at the Division 3 level. He will also be playing for the Bates Water Polo team. Giang is looking forward to swimming in college, but he knows it will be a whole new experience for him. One of the things that Giang will remember the most swimming for the high school is how his teammates have supported him and helped him develop into a strong competitor.